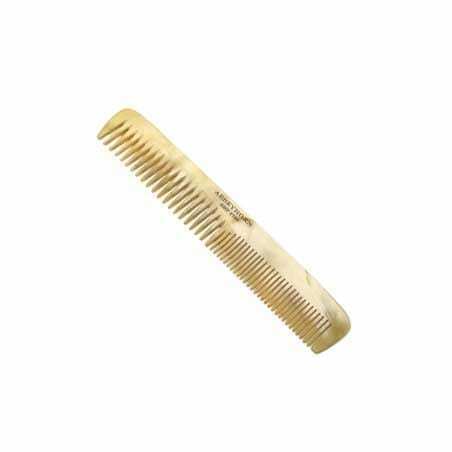 A double toothed comb with a strong square design. Made from real horn, each comb has its own unique, natural pattern. Horn combs benefit the hair in many ways; the horn collects the natural oils of the scalp then helps to distribute it throughout your hair, leaving it shiny and full of body. This natural oil will also help to keep the horn nourished. Horn combs have the added benefit of reducing static ‘ perfect if you suffer from flyaway hair when using plastic combs. Size: 26mm x 163mm. Made in England. Horn combs benefit the hair in many ways; the horn collects the natural oils of the scalp then helps to distribute it throughout your hair, leaving it shiny and full of body. This natural oil will also help to keep the horn nourished. Horn combs have the added benefit of reducing static – perfect if you suffer from flyaway hair when using plastic combs. Size: 26mm x 163mm. Made in England.